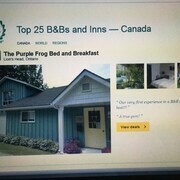 Situated in Wiarton, this motel is within 1 mi (2 km) of Bruce's Caves Conservation Area and Bruce Peninsula. 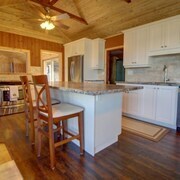 Bluewater Park is 1.2 mi (1.9 km) away. 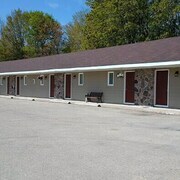 Situated in Wiarton, this motel is 0.1 mi (0.1 km) from Bruce Peninsula and within 3 mi (5 km) of Bluewater Park and Bruce's Caves Conservation Area. 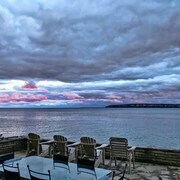 Situated near the beach, this bed & breakfast is steps from Dyer's Bay Beach and Bruce Peninsula. Dyers Bay Boat Launch is 1.1 mi (1.7 km) away. 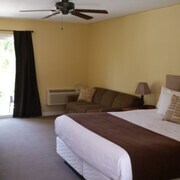 Perfect place to stay, very clean, the rooms are big and nice, very much recommended! Great outdoor field for activities, lovely clean rooms, comfy breakfast room and a good selection of breakfast foods and a friendly atmosphere all round. Where to find Lion's Head hotels near an airport? Where can I find hotels in Lion's Head that are near tourist attractions? There are no Expedia hotels in Lion's Head, so the best option is to make a reservation at one of the 3 hotels that are within driving distance. The closest Expedia hotel is the Wiarton Willy's Inn, Ontario, located 30 kilometres (19 miles) from the middle of Lion's Head. Another convenient option is the Top Notch Restaurant & Motel, situated in Ontario, 30 kilometres (19 miles) from the heart of Lion's Head. The N' This on the Bay is 30 kilometres (18 miles) from the middle of Lion's Head. If you have the time, why not spread your wings and investigate the other sites dotted around Southern Ontario while you are in the region? Southern Ontario offers beaches. 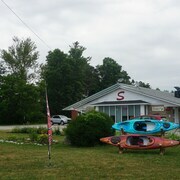 Popular Southern Ontario tourist destinations include traditional villages and churches. Visitors in this part of Canada often enjoy skiing. Looking for things to do? Why not spend some time discovering Station Beach and Kincardine Lighthouse, which you'll find in Kincardine, 95 kilometres (59 miles) to the south of Lion's Head. 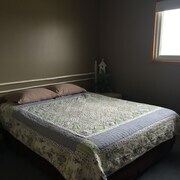 The Holiday Inn Express Hotel & Suites Kincardine - Downtown and Best Western Plus Governor's Inn are just some of the hotel alternatives in Kincardine. Alternatively, you could consider staying at Southampton, 55 kilometres (35 miles) to the south of Lion's Head, where you can choose from the Quality Inn and North Shore Cottages. The Saugeen Golf Club and South Port Golf Course are a couple of the more popular attractions to experience when visiting Southampton. Before you head home from Owen Sound, ensure you experience some sport. Visit Harry Lumley Bayshore Community Centre to the southeast of Lion's Head. Stay nearby to the action at the Best Western Inn On The Bay or the Comfort Inn Owen Sound. Expedia's destination page is a good way to discover more about Lion's Head. What are the most popular Lion's Head hotels? Are there hotels in other cities near Lion's Head? 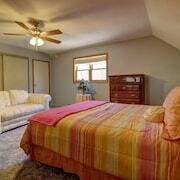 What other types of accommodations are available in Lion's Head? 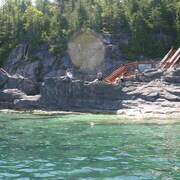 Explore Lion's Head with Expedia.ca’s Travel Guides to find the best flights, cars, holiday packages and more!